When I first saw ALAN LANE AGIN in bloom, it was at Larry Graces. I had talked to Linda soon afterwards about the daylily and she said ALAN LANE AGIN is good but the sib, RED FRIDAY, is great! So taking Linda’s advice I purchased RED FRIDAY. So did many other persons. I was later told Linda sold 175 pieces at $175.00 a single fan. Wow she could sell a daylily. Anyways, I forgot about ALAN LANE AGIN until a year later when John Benz requested that I pick a piece up from Larry Grace during a fall visit and bring back to him. Larry potted ALAN LANE AGIN up, I brought it home and I called John and asked him to come on over and pick up. Well, it was spring by the time John came over and ALAN LANE AGIN was dead in the pot. I remember John saying to me quietly under his breath that will be the last time he asks me to pick up something for him! I’m not sure if John ever did get another piece ALAN LANE AGIN. But I did. Why? Well after seeing multiple clean and bright colored kids in bloom a year later at a few hybridizers gardens, I could see that ALAN LANE AGIN produced a large number of keepers. These keepers were vividly bright and clean in color. Color! That’s the key word here. ALAN LANE AGIN was released in 2008 and the hybridizing potential is still virtually untested so it still should be used today. 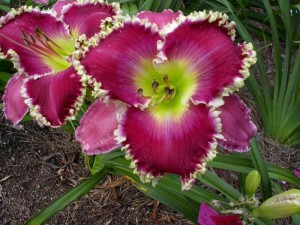 Based on what I’ve seen out of the kids produced, ALAN LANE AGIN ranks in my top 9 teeth daylilies from 2003-2008. BTW, John Benz if you still haven’t gotten a piece, I’ll give you one this spring. I’ve heard reports that it does survive in the North. My bad! (just in case you don’t know the definition for “my bad” it is as follows,*”I did something bad, and I recognize that I did something bad, but there is nothing that can be done for it now, and there is technically no reason to apologize for that error, so let’s just assume that I won’t do it again, get over it, and move on with our lives.” *urban dictionary. This entry was posted in Daylily Hybridizing, Introductions, Seedlings and tagged alan lane agin, blog, daylily blog, teeth. Bookmark the permalink. Mike, I never got ALAN LANE AGIN, and I never held that against you. You’re a true friend and have helped me so many times, I am eternally in your debt. On a quick note, I remember Linda saying that the reason those flowers came out so round and with the watermarks and such color saturation, is that she did NOT cross STARTLE directly to FORTUNE’S DEAREST, but to a seedling from (Fortune’s Dearest X Tetra Lavender Blue Baby) For some reason, the pedigree listred in the AHS database is missing the Tetra Lavender Blue Baby grandparent. I feel that this is a VERY important part of the pedigree, and would explain a lot about both the appearance and the parental potential of these 2 sibs. So Linda said that Red Friday was better – good salesmanship or truth? What has been your experience with both cultivars? What have you seen from other programs using the two sibs? I purchased Alan Lane Agin in 2008 from the lily auction. It has been hardy for me here in the north. It is a beautiful flower and easier to set pods on than Red Friday. I was one of the 175 people to buy Red Friday from Linda Agin. One of the only times I got to speak to her. She was very nice and I enjoy growing a lot of her daylilies in my garden. I have bloomed one Alan Lane Agin seedling this year, so I have to wait to see more of what it can do. Also waiting on Red friday seedlings. I had one seedling (Aliquippa x Red Friday) that I will email you a picture of. Great blog. Linda’s website is still available and she listed the parents of Alan Lane Agin and Red Friday as Startle x Fortune’s Dearest. Linda was quite proud of the Red Friday seedlings when we visited her the last time. She told me that she took special care to only use RF on parents with good color. ALA and RF have both been hardy in our zone 5 garden for several years now.